All-terrain vehicles continue to soar in popularity as people use them around the neighborhood, on the farm, or at the deer lease. Unfortunately, they offer little protection for the driver or passengers. The attorneys at The Law Offices of Frank L. Branson represent individuals injured on ATVs such as four-wheelers, three-wheelers, Gators, and golf carts. ATVs weigh hundreds of pounds and are plagued with dangerous design flaws and manufacturing defects that can cause serious and fatal ATV accidents and injuries including brain and head injuries, spinal cord injuries, neck injuries, and amputations. 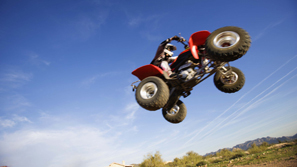 The U.S. Consumer Product Safety Commission reports hundreds of deaths and more than 100,000 ATV-related injuries each year, and has issued dozens of recalls for defects including faulty brakes, suspension systems, steering systems, and fire hazards. The attorneys at The Law Offices of Frank L. Branson understand how to navigate the CPSC regulations and the patchwork of state laws covering the ATV industry. The attorneys at The Law Offices of Frank L. Branson understand how ATV accidents can dramatically change the lives of victims and their families. Our team of lawyers, transportation experts, and medical professionals thoroughly investigate the accident and examine the vehicle. Armed with this information, Dallas attorney Frank L. Branson and his firm vigilantly pursue fair compensation for clients. To learn more about our experience in ATV accident matters, we invite you to contact the firm here.